Creamy Thai Coconut Chicken Soup - easiest and fastest Thai coconut chicken recipe ever! Takes only 15 mins and dinner is ready! What is Thai Coconut Chicken Soup? I am super excited to share this Instant Pot creamy Thai coconut chicken soup, which is a Thai-flavored chicken soup made with coconut milk and chicken broth, infused with Thai herbs plus fresh lime juice. This creamy Thai coconut chicken soup takes only 15 minutes to make and the end result is absolutely scrumptious. If you don’t have an Instant Pot, you can use a slow cooker or make this soup on a stove top. I am sure many of you bought an Instant Pot on black Friday sales. I got mine a few weeks ago and this is my second Instant Pot recipe and I absolutely love the pressure cooker. Many of my readers have been asking me to convert my popular Asian recipes to Instant pot recipes so here it is an Instant Pot soup recipe you have been looking for. Here are the key ingredients used in this mouthwatering soup. Turn on the Saute mode on your Instant Pot. Add the onion and saute for 10 seconds before adding the chicken. Saute the chicken until the surface turns white. Add the Thai curry paste, bell peppers, galangal and kaffir lime leaves (if using), stir to mix well. Add the chicken broth, fish sauce and sugar. Cover the pot and select High pressure for 6 minutes. When it beeps, turn to Quick Release. When the valve drops, remove the lid carefully, add the coconut milk and lime juice to the soup, stir to mix well. Top with cilantro and serve immediately. If you can't find galangal and kaffir lime leaves (they are hard to find unless you go to a good Asian store), you can use lemongrass and skip the two ingredients. Lemongrass is not a substitute for both galangal and kaffir lime leaves but it will infuse the soup with its unique fragrance and aroma. If you don't have an Instant Pot, you can add all ingredients in the slow cooker (except coconut milk, lime juice and cilantro) and slow cook for 4-6 hours. Add the coconut milk, lime juice and cilantro when it's done cooking. You may also cook the soup on a stove. The steps are the same, except that you use a regular soup pot to cook. You may want to slowly simmer the chicken soup for about 15-20 minutes before you add the coconut milk, lime juice and cilantro. May I substitute chicken with fish? You can but not ideal. 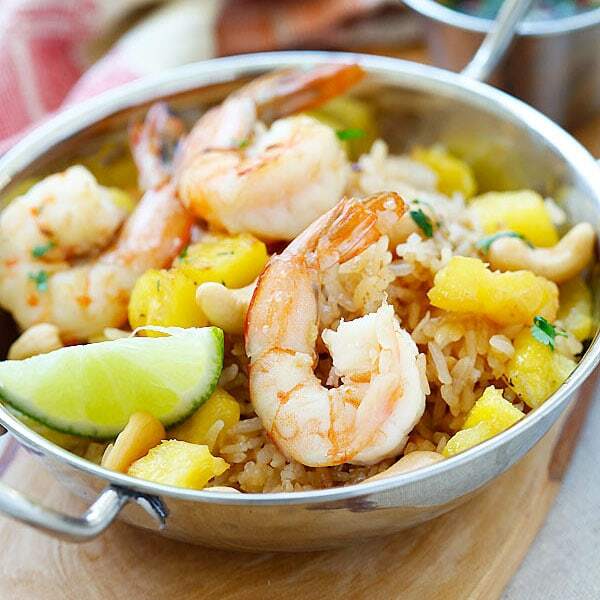 You can use shrimp, but fish is not a very good option. What can be used as a substitute for kaffir lime leaves. I am unable to find in our Asian Markets here. They are optional. There is no substitute. I buy kafir leaves on Amazon. when they come, I freeze them. They add A LOT to the flavor. You can get kaffir lime leaves on Amazon. They call these leaves, Lime Leaves at my local Asian market. Will this work with cubed pork loin? I think you can use it…but this is meant as a chicken soup. What about adding lime zest into the soup in place of the leaves? I’ve seen that substitute in Panang curry recipes. This recipe was amazing! I don’t have an Instant Pot, so I made it in the slow cooker. With the exception of the kaffir lime leaves, which I could not find, I followed the recipe as written. So happy to have found your blog! How long did you cook it in your crockpot? Hi, where did you get your instant pot? I live in South Dakota, and can’t source many fresh ingredients. Would I be able to substitute ginger for the galangal, and can I use dried kaffir lime leaves? I would love to make this for my IP! You can skip it but Thai food uses sugar in almost everything. Can you add noodles to This? What kind do you suggest? Yes, you can use ramen or whatever, but after the soup is cooked. Would you cook the noodles first or in the instant pot? I’m new to the instant pot. You can cook the noodles separately. Don’t cook the noodles in Instant Pot. I made this soup for dinner and it gets 5 stars in our household! Only thing I couldn’t find were the lime leaves. I put lemongrass in for additional flavor too. thank you for a great recipe! I will definitely be making this again. This was really good, simple to make and not too many ingredients (always a plus!) It also led me to discover a little Thai supermarket in my neighborhood that I never thought to stop in, and I was able to find the lime leaves and galangal there! It was a tad bit spicy for me, is there anything I can do on that end? I told my husband to add some coconut milk to his bowl of soup. Then it was less spicy for him and he loved it, and my son and I could still have it more spicy. Awesome, I am so glad you tried my Creamy Thai Coconut Chicken Soup! Also, is there a section on your website with only Instant Pot recipes? I couldn’t find in the search function. Thanks! Just curious…have you all been using the full 2 pounds of chicken called for in the recipe? That’s 1/2 pound of chicken per person! Also, I have dried kaffir lime leaves. Should I use them and how? You can eat for two meals! You can use the dry kaffir lime leaves but they won’t impart much aromas. Ten minutes is way too many minutes for the peppers. They were completely overcooked and the skins were just falling off. Did you cut them too small? Look at my pictures. They are how they turn out for me. You can cook for 5 minutes if you like. I almost always add peppers after the pressure and cook on Saute for about 4-6 minutes because i like mine a little crisp. What about lemongrass paste if I couldn’t get lemongrass of kaffir? And if so, how much? What if I just want to make this as a curry instead of soup dish… do I reduce the liquid? i was terribly disappointed in this recipe. It had absolutely no taste to it. I followed the directions flawlessly. It was watery and tasteless. NOTHING like the coconut soup I love. Hi LeAnn, this shouldn’t be overly watery, also it shouldn’t be tasteless. Great recipe. I put in my boneless chicken thighs in whole and shredded them afterwards (yay, no cutting board & knife to wash). Next time I’ll try adding mushrooms that are normally in tom kha gai. Would love to see more recipes for Instant Pot in the future. Thanks! This is delicious. Tastes the same as what you would get in a Thai restaurant! 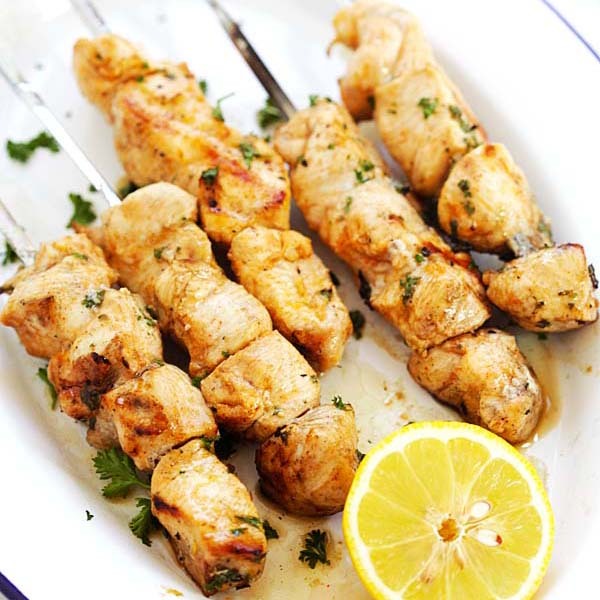 Very flavourful and extremely easy to make. Love it! I’m extremely picky with recipes and this is getting printed out and added to my recipe book. Excellent! How many calories per serving? Would add some more spice next time to make it a bit hotter. Well, I got an Instant Pot for Christmas from my wife, and this was the first recipe I tried in it. I can’t get galangal, lime leaves, or lemongrass here in the sticks where I live without a 2 hour round trip to the Asian market, so I used slice ginger (my wife loves ginger) and lemongrass paste that I could find at the local supermarket. Turned out very well, my wife loves soups like this. We had the leftovers the next day, which were even more tasty as the flavors had developed more. A wonderful introduction to the Instant Pot. For my 2nd recipe in the pot I made traditional Southern chicken and dumplings, used it to pressure cook the chicken and make the base broth. A very useful little kitchen item, so far it seems like a good purchase! Hi JS, that’s great to hear. Yes this Thai coconut chicken soup is an amazing recipe. It tastes so good! I used lemongrass. This soup is amazing! Super quick to make too! Yes, so good! Lemongrass alone is great. This creamy Thai coconut chicken soup is really amazing. The soup was delicious! Can it be made with Tofu? If so, when would I add it in the cooking process? Yes you can use tofu. Just add it during the same time as chicken. Do you use coconut milk from the can or from a carton? Can or carton is both fine. I just cooked this recipe verbatim and the veggies were basically mush. The flavor was good and the chicken was great but I had to throw all the veggies out as they were just horrible. I feel like 10 mins at high pressure for the peppers and onions is way too long. Hi Dustin, that was strange. I cooked exactly the same and if you see my pictures, the veggies were fine. Did you cut your vegetables the same way I did? did…I cut the onions into quarters and the peppers into strips. If I were to make this again I would probably cook the veggies separately and add them after the chicken has cooked. This was good, but we were expecting it to be creamy, as the name of the recipe indicates, it was a regular broth. My red peppers were mush as well. I wish I would have added them AFTER the pressure cooking portion was finished. And, the chicken took on the fish taste from the fish sauce, I would add 1.5 tablespoons rather than 2.5. I would have preferred the chicken to taste like chicken and the sauce having a hint of the fish taste. Don’t get me wrong, we like fish sauce, but would prefer it not mingle too much with the chicken. If we made this again, I would make those adjustments. Hi Kathi, what brand of fish sauce did you use? 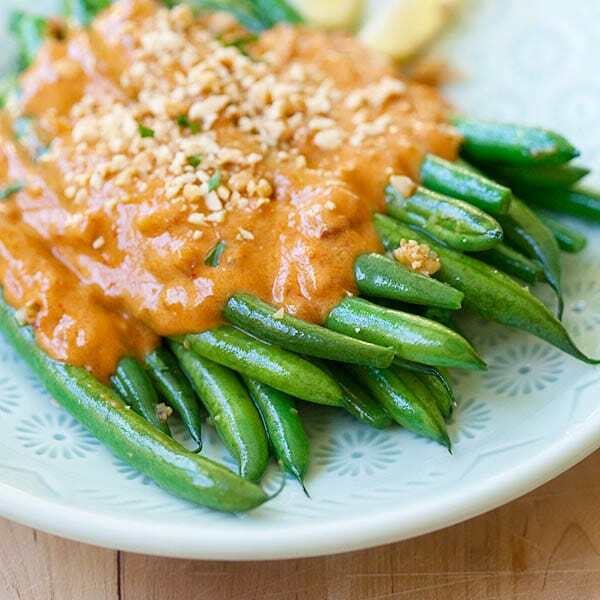 Instead of Red curry paste, can I use green curry paste? If I were to add the red peppers after when mixing in the coconut and lime juice, will that be ok? Or the peppers will be undercooked? Yes you can add later, just turn on the saute function to cook the red peppers. I live alone and would lie to make your chicken soup and freeze the left-over. Will it freeze successfully? I love the new page design! 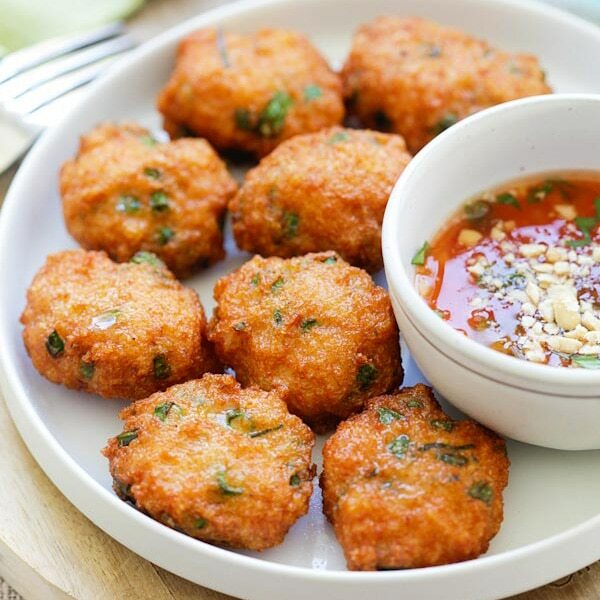 Can’t wait to try the pumpkin fritters and the Thai Coconut Chicken Soup. Yum!! this was insanely good! Tastes just like the soup we used to get at the Thai restaurant we used to go to in Chicago. Thank you so much! I was able to find the ingredients at the Thai grocery store in town. Cut the curry paste down by half for my toddle and husband who doesn’t like spice. I made this tonight and it was delicious! I definitely recommend for anyone interested. I am fortunate to have an Asian market with all of the ingredients so the kefir leaves and galangal was great. I am wondering if you would recommend freezing this. We are meal prepping and would love to have some on hand. Thanks! Sure Britt, you can freeze this creamy Thai coconut chicken soup! 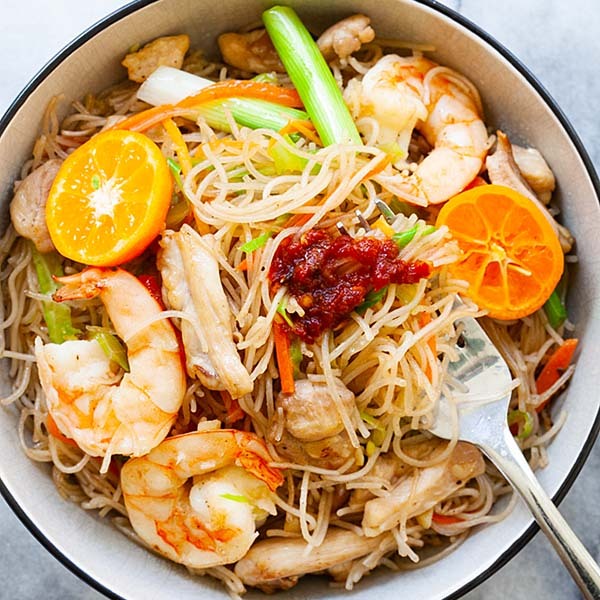 This recipe is delicious… I added bamboo shoots and some red pepper flakes. I do have a question. My daughter has a coconut allergy. Is there anything to sub for the coconut milk? Almond milk maybe? I know anything else will change the flavor some but she really wants to try this. Thank you in advance for your reply. You can try milk. I am so happy you love this recipe! Thanks for sharing this amazing Thai soup recipe. I always prefer to cook this on my weekends. 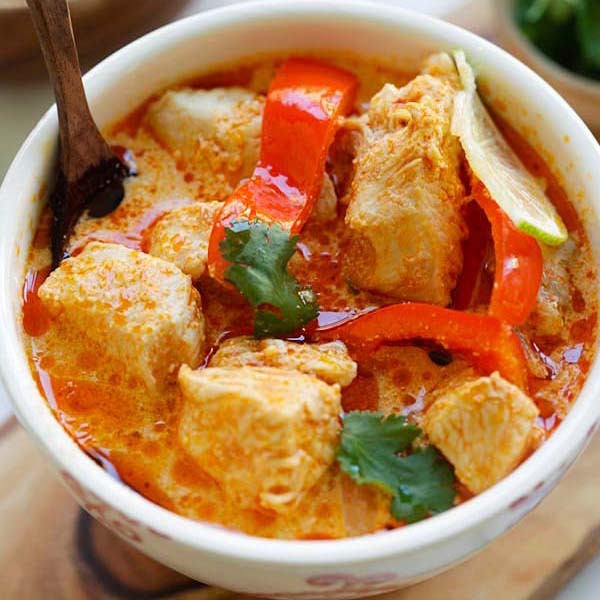 Thai Chicken Coconut Soup is a rich, aromatic and delicious soup dish with medium spiciness. Its combination of exotic vegetables, roots and spices with a rich and creamy coconut-infused broth makes for an amazingly delicious meal with exquisite aroma and taste. I have learnt many Thai dishes at “My Thai cooking “. 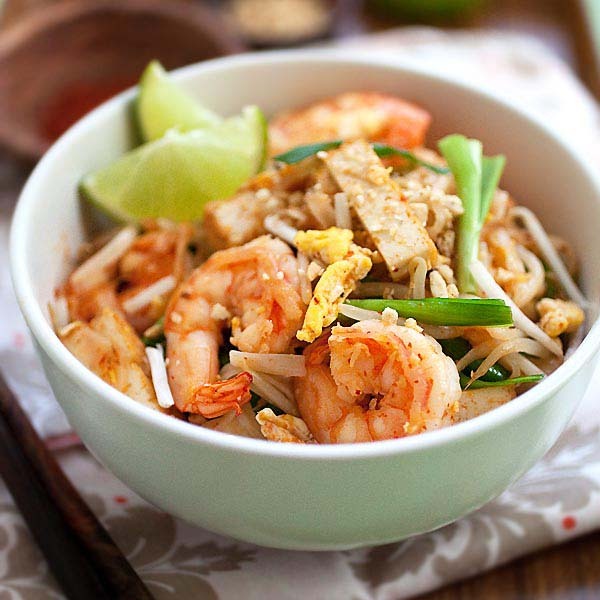 They offer entertaining & engaging Thai cuisine and cooking classes in Bangkok. I recommend this on my own experience. Awesome so glad that you tried this coconut chicken soup recipe and liked it. Made this last night. It came out amazing! I was fortunate to have all the ingredients on hand! 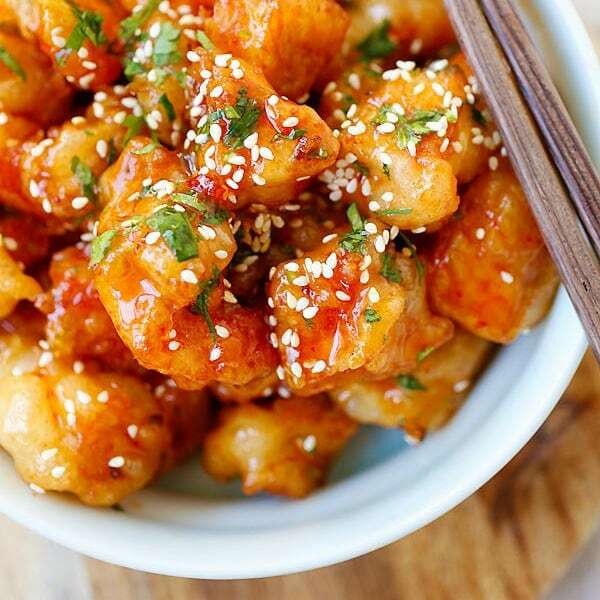 Thank you for this very simple but delicious recipe. I sliced the peppers thin and cooked them for a few minutes after the pressure was released with the IP on saute before adding the coconut and lime juice. Hi Maya, thanks so much for trying this creamy Thai coconut chicken soup. It’s very yummy! This soup looks dreamy!!! I love soups that have a Thai flair. Thanks for sharing, love your recipes!